The Press Attendant is a press automation and monitoring package that combines tonnage monitoring, die protection, programmable limit switches, brake monitoring, motion detection and more into ONE encoder-based system. This all-in-one package will help protect your investment and reduce downtime. 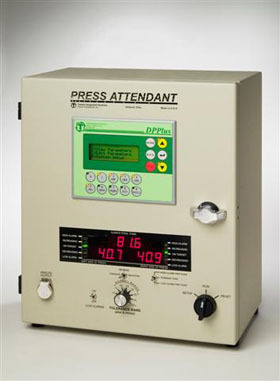 The Press Attendant is comprised of two products, the DPPlus and tonnage monitor. The DPPlus controls the die protection and PLS features, while the tonnage monitor is used to protect your press and die from hard hits. The DPPlus unit press automation system includes a controller with operator interface, output relays, die protection inputs, and brake input. The DPPlus unit offers 8 programmable limit switch (PLS) outputs that can be used to control press automation equipment such as feeders (feed and pilot release), air blow off, part lubricators and more. The die protection inputs allow sensors to be fed into the controller to monitor the strip progression (short and long feeds), part ejection, buckle detection and other events to prevent crashes. The brake monitor can be used to monitor the stopping performance of the brake each time it is activated. The system incorporates batch and total counters that can be used to shut the press down upon reaching the count as well as tool and stroke counters that can be reset. All settings can be stored in one of 50 jobs. The tonnage unit is a two channel, compact, inexpensive and simple-to-use tonnage monitor. It is capable of displaying the load for both sides of the press as well as the total press tonnage. Both the left and right side displays have a bar graph that visually shows the deviation from the benchmark tonnage. This allows the operator to easily watch the repeatability of forming loads. Dimensions 12.5 " 14.5 " 6.68 "